You want to buy the very best ring that you can, but often it is hard to know where to begin when you first start to look at engagement rings. Trying to decide what you like best is difficult when there are so many options. If you’ve been looking for your very own special ring and can’t find “The One”, this guide will help you through the process. There are three main elements to an engagement ring: the ring design, the shape of the diamond or sapphire, and the quality of the gemstone. Having your ring custom made means that you can have the design features you love! We can also tailor the diamond selection so that you buy the diamond that works best for you and your budget. There are four main different types of ring design: solitaire, halo, three stone rings (trilogy rings) and rings with shoulder stones. The solitaire is, as the name suggests, an engagement ring set with a single diamond or sapphire. It is a classic look that will never go out of fashion. The halo is an engagement ring that has a halo of small diamonds surrounding the central diamond. The trilogy ring is an engagement ring that has three main diamonds. It is usual to have the central diamond larger than the two flanking it. Popular culture says that the trilogy ring symbolises the stages of your relationship. One diamond represents the memories of your past, another diamond represents the present, and the third stone represents your future together. Engagement rings with shoulder diamonds are rings that have some sort of diamond detail in the band. 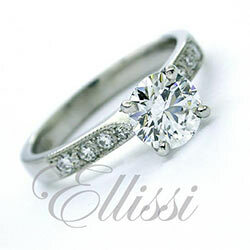 Round diamonds, or round brilliant cut diamonds are the most popular diamond shape for engagement rings. This is probably because their shape is the best for maximising the diamond’s light refraction. Of course, how great that light refraction is will depend on how good a cut it is. Cushion cut diamonds are like a soft square. They are a fantastic choice, provided the diamond has a really nice cut. Princess cut diamonds are square in shape. They do not have the soft corners of the cushion cut. The internal faceting of the princess cut varies from diamond to diamond: some are much better than others. The Asscher cut, or square emerald cut, as it is sometimes known, is a very symmetrical cut with large facets. It is a square shape, with the corners cut off. The Asscher cut has big, strong flashes of light, rather than smaller, glittery flashes. The Emerald cut diamond is like the Asscher cut, but it is a more rectangular shape. The shape can vary from stone to stone, from long and thin, to fatter shapes. Different shapes will suit different ring designs, some working better than others. The oval cut diamond is, as the name suggests, oval in shape. Some ovals are long and thin, others are fatter and can almost be verging on round in shape. The pear cut diamond is just like a pear that you eat. It has a bell bottom, that tapers to a point at the top. 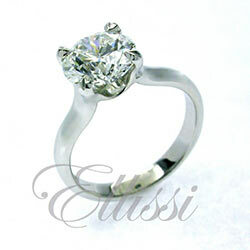 The Radiant Cut can be long and rectangular, or square. Like the emerald cut diamond, it looks like a square or rectangle with the corners cut off. Radiant cut diamonds are similar, but not the same as the princess cut diamond in their internal faceting. Engagement rings are usually set with either diamonds or sapphires. Of course these gemstones are very, very beautiful, so are an ideal choice for making a stunning ring. But there is also a sound practical reason for choosing diamonds or sapphires as the gemstone for an engagement ring, and that is for the durability of the ring. For any ring to last, it must be well made. It must also be set with gemstones that do not break easily. Diamonds and sapphires are the hardest known precious gemstones, so are perfect for use in engagement rings. This is not to say that diamonds, sapphires and engagement rings are indestructible! Gold is a soft metal, and if you mistreat or accidentally damage your ring, gemstones including diamonds can break. You should take care to look after your engagement ring if you would like it to last for your lifetime and beyond.